At the invitation of President Xi Jinping, King Tupou VI of the Kingdom of Tonga will pay a state visit to China from February 28 to March 8. Q: According to US media reports, Liu He, member of the Political Bureau of the Communist Party of China (CPC) Central Committee and Director of the General Office of the Central Leading Group for Financial and Economic Affairs, will visit the US. Could you confirm that? 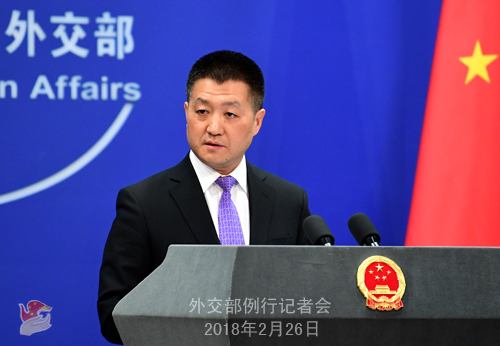 A: I can confirm that at the invitation of the US government, Liu He, member of the Political Bureau of the CPC Central Committee and Director of the General Office of the Central Leading Group for Financial and Economic Affairs, will visit the US from February 27 to March 3. The two sides will exchange views on China-US relations and bilateral cooperation in the field of trade and economy. Q:Blue House Spokesperson reportedly said on February 25 that President Moon Jae-in met with Kim Yong-chol, Vice Chairman of the Workers' Party of Korea (WPK) and Director of the WPK United Front Department. Kim Yong-chol relayed the DPRK leader Kim Jong-un's willingness to improve DPRK-ROK ties. He also said that the DPRK-US relations must develop along with the DPRK-ROK relations while noting the DPRK has enough intention to hold dialogues with the US. What is your comment? A: We have noted relevant reports. We welcome these positive steps the DPRK and the ROK have made recently on engaging in dialogues and improving bilateral ties, which absolutely needs to be further encouraged. We also have stressed many times that the core of the Korean Peninsula nuclear issue is about security, the settlement of which hinges on the DPRK and the US. Thus, direct talks between the two parties are indispensable if the Korean Peninsula nuclear issue is to be resolved and a fundamental turnaround in the Korean Peninsula situation is to be achieved. We hope that all relevant parties could work together towards the same direction and continue with their support for the improvement of the DPRK-ROK relations so that the hard-won detente on the Korean Peninsula could be sustained and strengthened. Hopefully positive steps can be made by both the DPRK and the US towards opening dialogues and achieving meaningful progress in resolving the Korean Peninsula issue peacefully through talks. Q: Was there any contact between Chinese Vice Premier Liu Yandong and official from the DPRK on the sidelines of the closing ceremony of the Pyeongchang Winter Olympic Games? If yes, what topics came up in their talk? A: I'm not aware of what you mentioned. 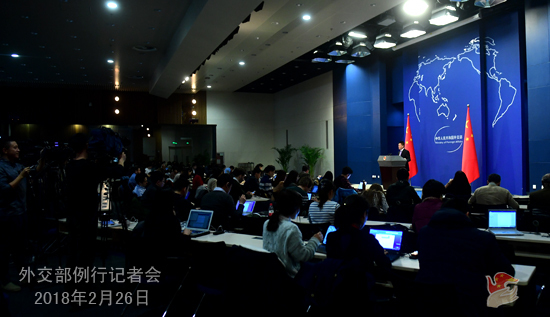 Q: The Kyodo News cited sources on February 23 saying that the DPRK has started preparations to resume reunions of separated families. The topic may be discussed during talks between ROK President Moon Jae In and Kim Yong-chol who led a DPRK delegation to the closing ceremony of the Pyeongchang Winter Olympics. What is your comment? A: We have noted relevant reports. If the DPRK and the ROK could make that happen again, it would be good news for the two countries, other regional countries and the international community. As a close neighbor to the Korean Peninsula, China has always been supportive of the DPRK and the ROK in improving their ties through dialogues and making concrete steps to advance reconciliation and cooperation. Recently, the DPRK and the ROK have made positive progress in bettering ties, which are quite heartening. 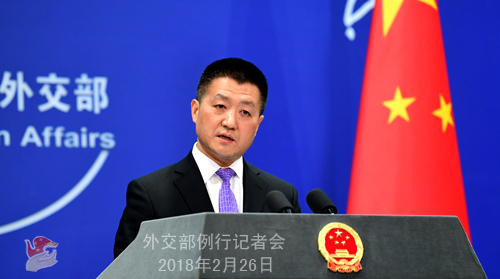 China sincerely hopes that the DPRK and the ROK could seize this opportunity, build on such good momentum, carry on dialogue and cooperation in good faith, and make joint efforts to further improve ties, alleviate the regional situation, and maintain peace and stability on the Korean Peninsula. Q: You just said that King Tupou VI of the Kingdom of Tonga is going to visit China. Could you please tell us more about the schedule of this visit? How does China look at the current China-Tonga relations? What's China's expectation for this visit? A: King Tupou VI's upcoming state visit is an important high-level interaction between China and Tonga as the two countries usher in the 20th anniversary of the establishment of diplomatic ties. During the visit, President Xi Jinping will hold a talk with King Tupou VI and Premier Li Keqiang will also meet with him. The leaders of the two states will exchange views on China-Tonga relations and other important issues of mutual interest. According to the information I have at my hand so far, King Tupou VI will visit Zhejiang, Hainan and Guangdong apart from Beijing. Since the establishment of diplomatic ties between China and Tonga 20 years ago, the China-Tonga relations have made great headway with concerted efforts of the two sides. Under the guidance of the important consensus reached between President Xi Jinping and his Tongan counterpart in November 2014 on building a strategic partnership featuring mutual respect and common development, the China-Tonga relations have entered a new stage of rapid development. The exchanges at high and other levels between the two sides are close and fruitful outcomes have been achieved in exchange and cooperation in trade and economy, agriculture and fishery, infrastructure construction, people-to-people and subnational interaction and other fields. The two sides have also maintained sound communication and coordination in international and regional affairs. China stands ready to, taking the opportunity of King Tupou VI's visit and the 20th anniversary of the establishment of diplomatic ties, work with Tonga to enhance mutual political trust, expand practical cooperation, promote greater development of China-Tonga relations and deliver more benefits to the two peoples.